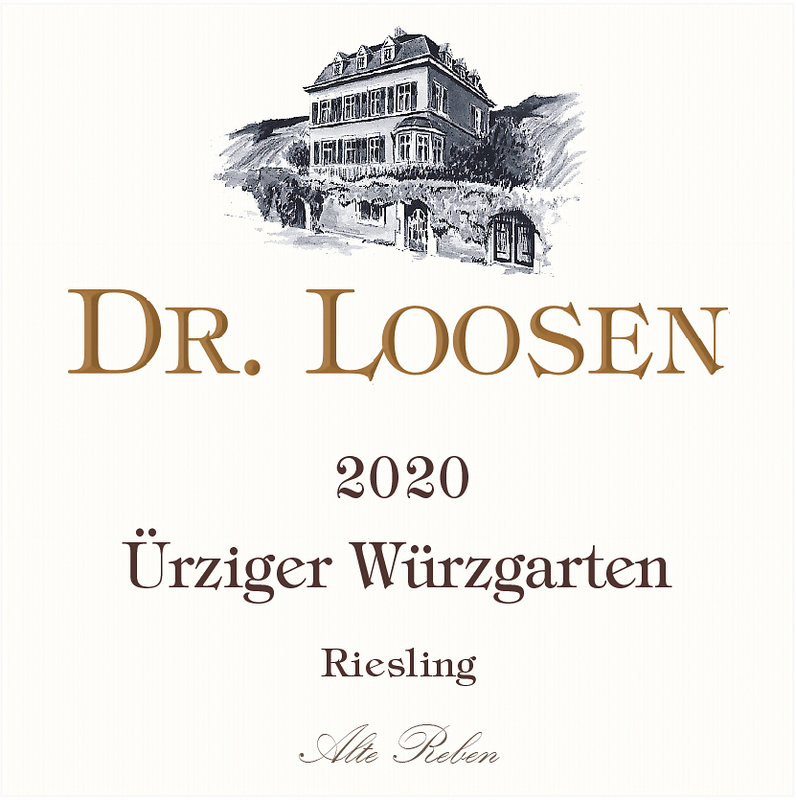 Our popular non-estate Dr. L Rieslings offer a great value. Perfect for wine lovers new to Riesling, for everyday enjoyment and for occasions when you’re serving wine to a large number of guests. 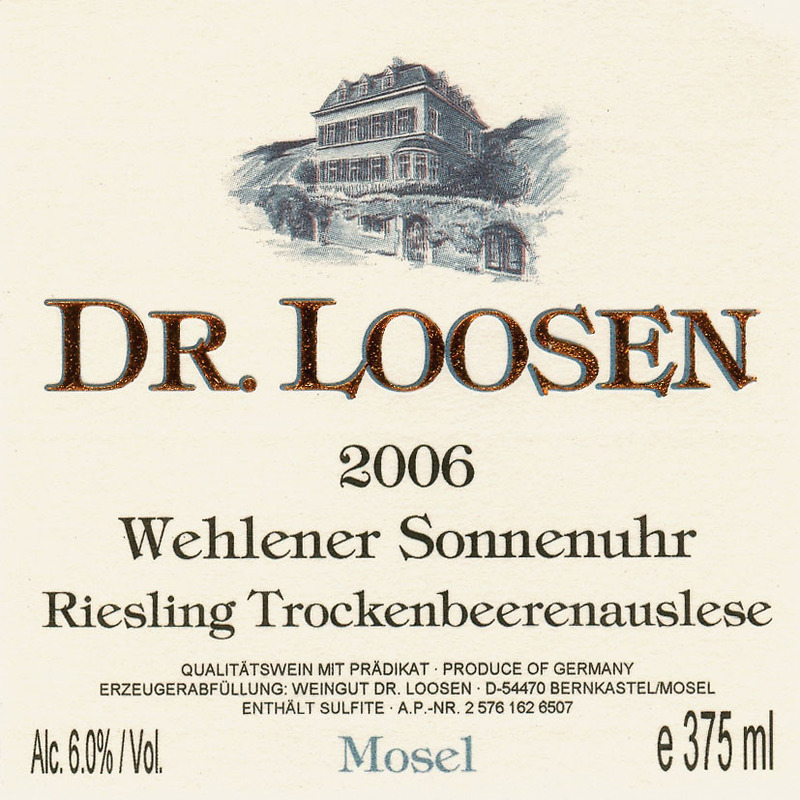 This crisp, refreshing Riesling is the dry counterpart to the fruity, off-dry Dr. L Riesling. Together, these two wines represent the entry-level from Dr. 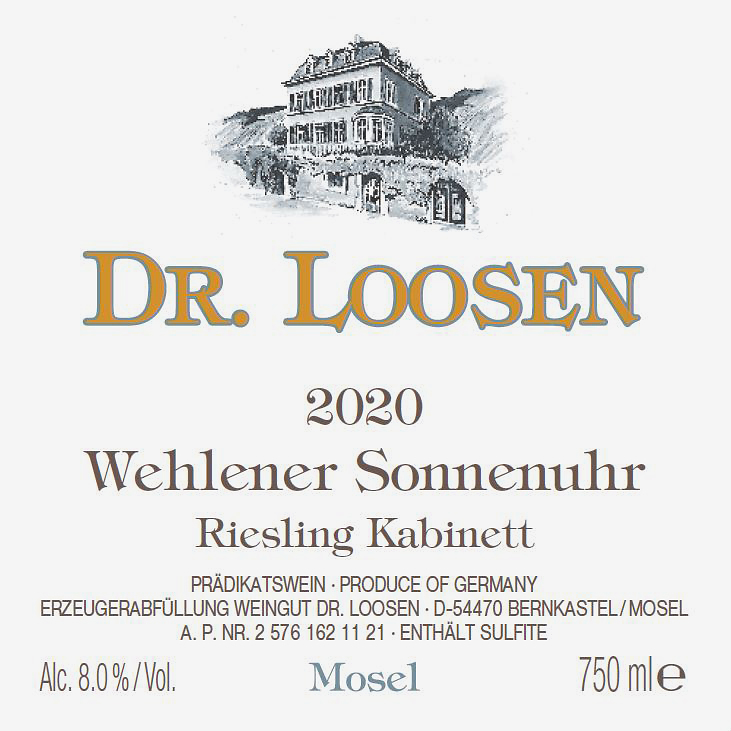 Loosen, capturing the elegant and racy characteristics of steep, slate-soil Mosel vineyards at a very reasonable price. We call them our “welcome to the Mosel” wines. 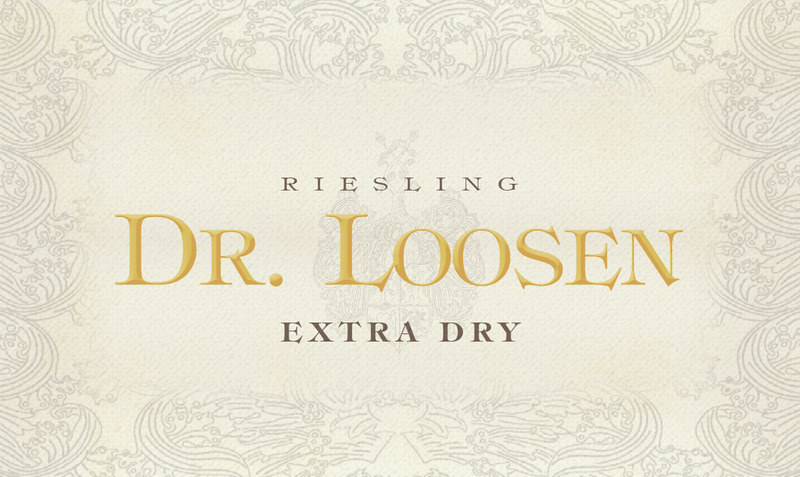 Dr. L Sparkling Riesling is 100% pure Riesling — the crisp, fruity grape that has made German wine famous for centuries. We make it using the Charmat method, where the second fermentation is done in a pressurized tank to keep the bubbles in the wine. This produces bright, clean sparkling wines in a more affordable way, which makes it possible to offer this charming bubbler at a very nice everyday price. 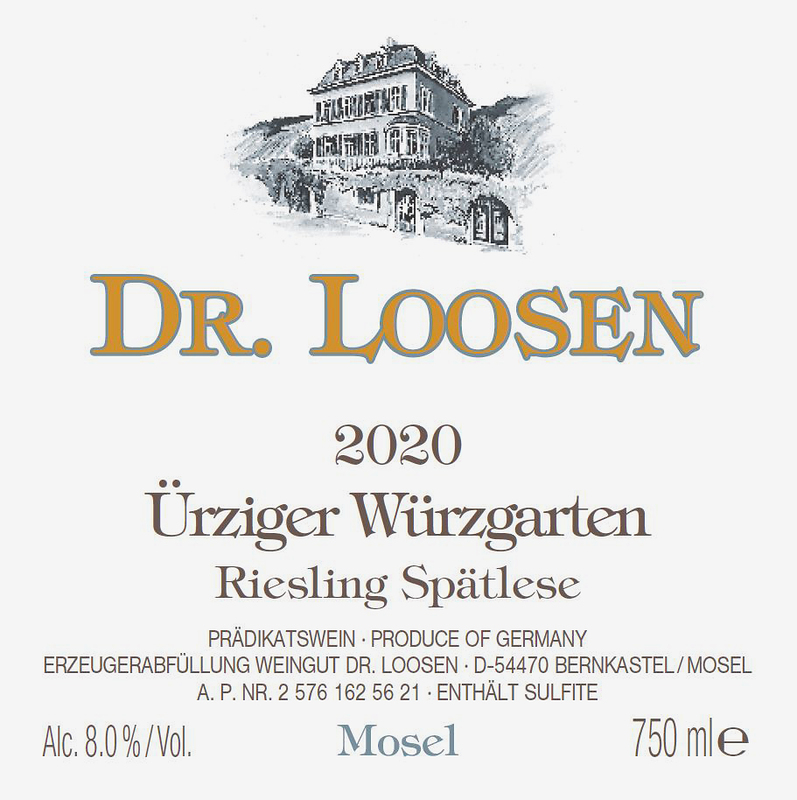 With warmer growing seasons, better viticulture and improved cellar techniques, it is becoming possible to make balanced, full-bodied, dry (trocken) Rieslings in the Mosel valley. 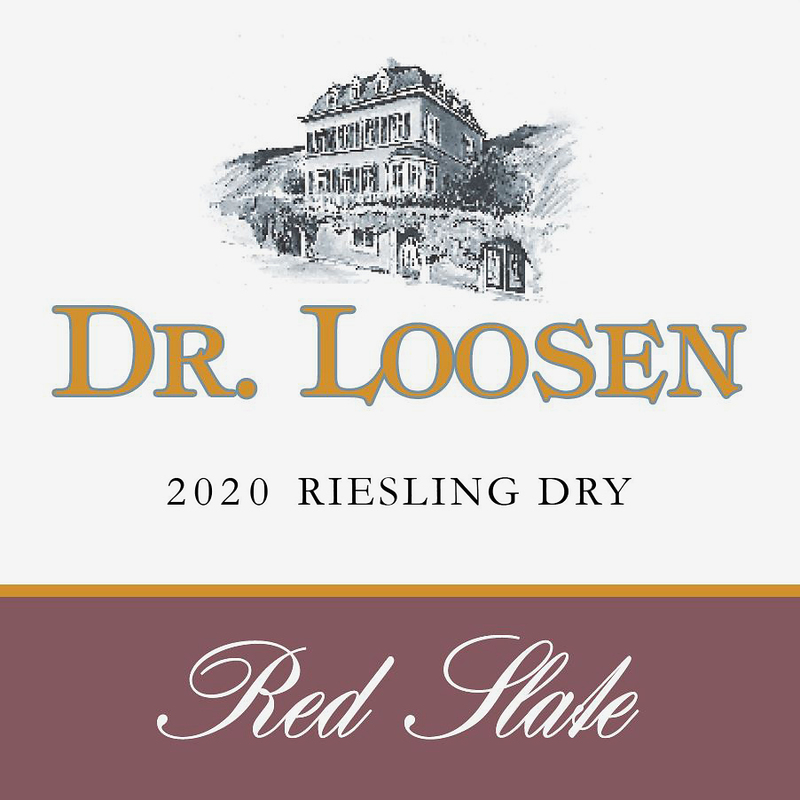 The “Red Slate” Riesling, from red slate parcels in Ürzig and Erden, has an intense minerality that is warm and enveloping, with a floral, spicy, citrus blossom aroma and a harmonious palate. The dry style is ideal for classic continental cuisine. 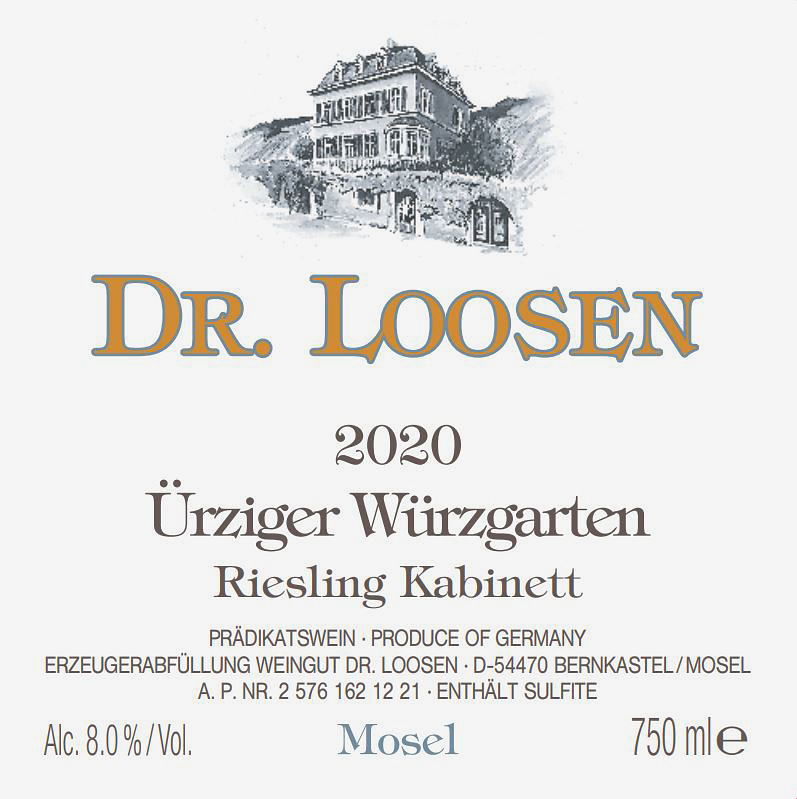 This estate-grown Riesling Kabinett showcases the mineral-driven style of the steep, blue slate vineyards in the middle Mosel. It comes from parcels owned by Dr. Loosen in the villages of Bernkastel, Graach and Wehlen, where the soil is pure blue slate. It is bright and vibrant with the classic white peach fruit and floral, flinty minerality that is so typical of this terroir. This wine makes an elegant aperitif and is an excellent match for seafood and spicy Asian cuisine. Sparkling wine, called “Sekt” in German, has a long history in Germany. A fact that you can see in the many German family names among famous Champagne houses (think Bollinger, Krug and Mumm, for example). Dr. 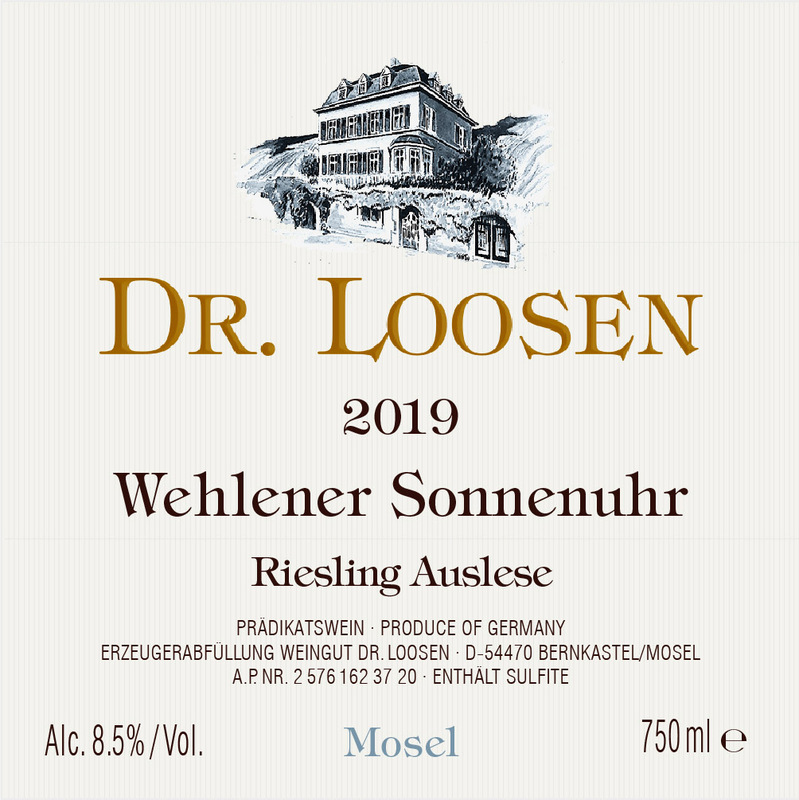 Loosen celebrates this tradition with an Extra Dry Sekt from 100% Riesling, which makes excellent sparkling wine because of its natural acidity. The Dr. Loosen Sekt Extra Dry is produced with fruit from estate vineyards in the Middle Mosel. 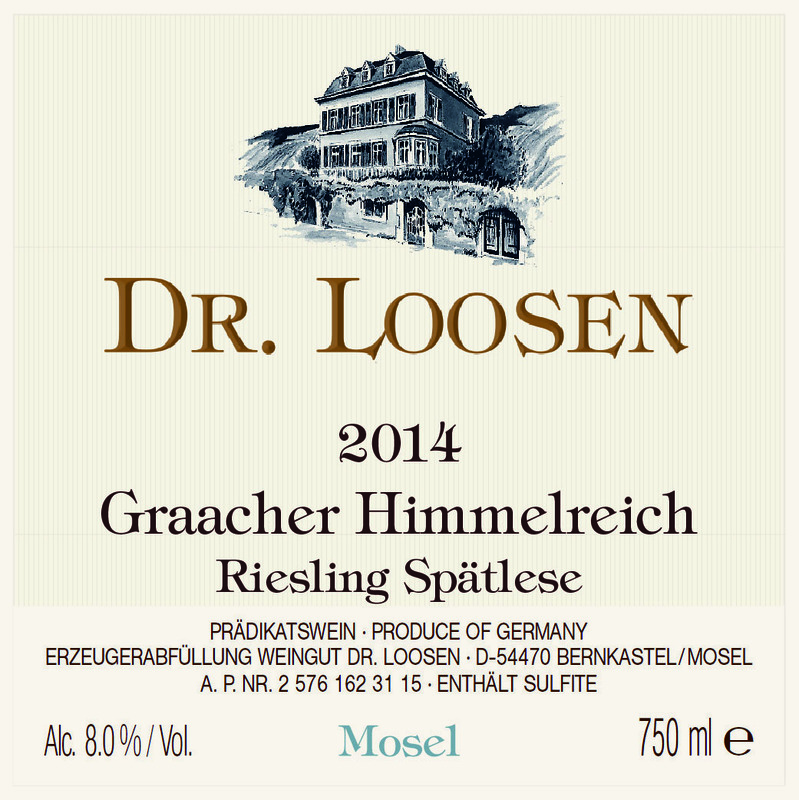 Bottle fermented, it is brisk and refreshing, with pure Riesling fruit and crisp acidity. When we acquired a small parcel of Pinot Noir vines in Ürziger Würzgarten, we were not really sure what to do with them. There is no real tradition for Pinot Noir on the Mosel, but we do love the variety, so it would have been a shame not to do something fantastic with these grapes. The most logical idea was to combine our love for Pinot Noir with our passion for great sparkling wine and produce a vintage Rosé Sekt. After five years on the fine lees in the bottle, in the traditional Champagne method, we have released our first vintage: the 2011 Dr. 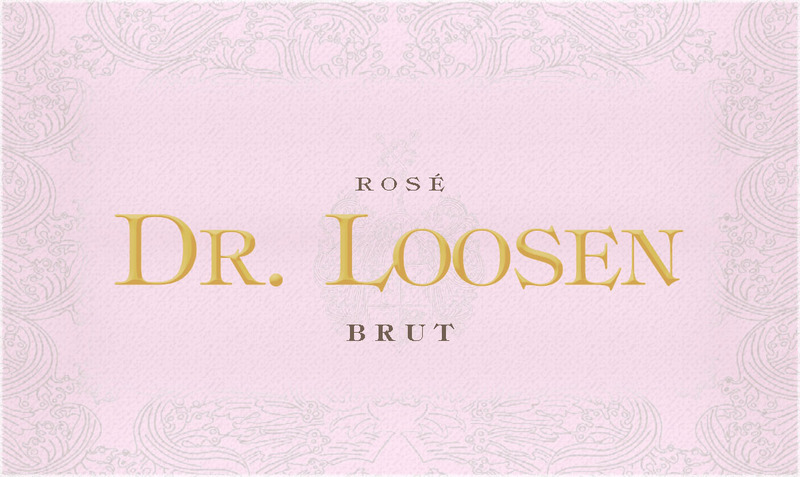 Loosen Pinot Noir Rosé Sekt. Special-selection Rieslings from our six Grosse Lage (grand cru) vineyards. 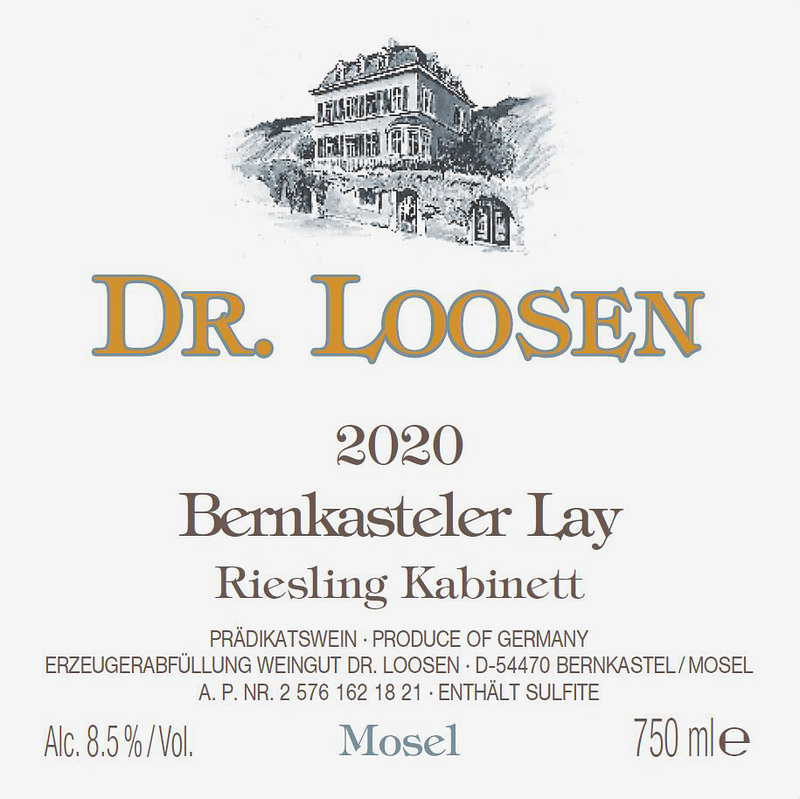 Bernkasteler Lay (pronounced LIE) is situated between the Dr. Loosen estate house and the village of Bernkastel. The soil is predominantly slate, but is heavier and deeper than in the neighboring villages of Wehlen and Graach. This site also has a slightly gentler slope than the estate’s other vineyards. It produces richly textured, assertive wines. A small village named Graach lies between two more-famous neighbors: Bernkastel and Wehlen. This vineyard’s steep, southwest-facing slopes and deep soils produce wines that combine the elegance of Wehlen with the rustic strength of Bernkastel. 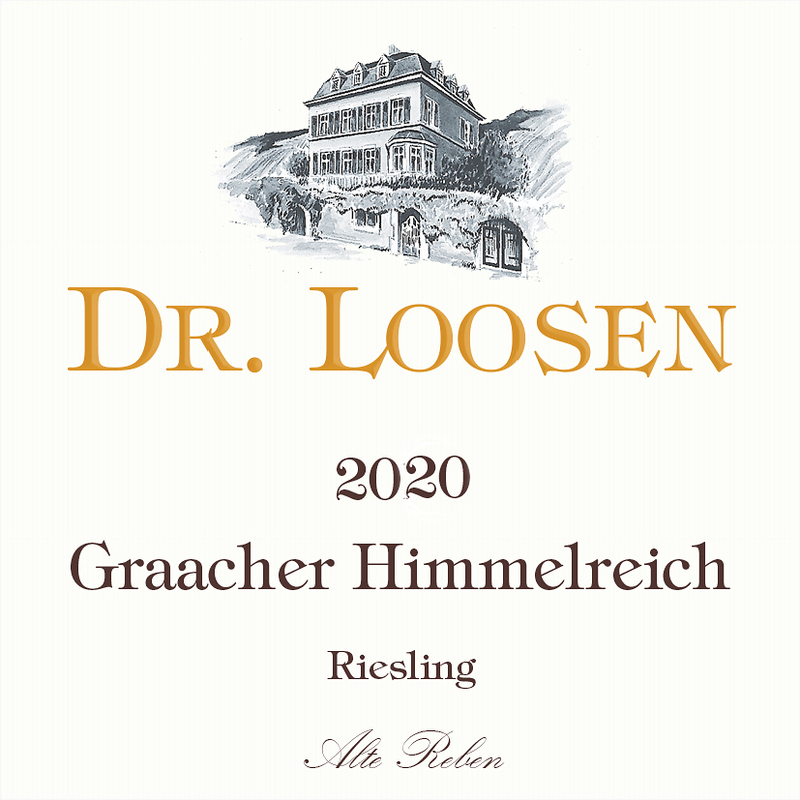 Because of the forceful minerality from the abundant blue slate in the soil, wines from Graach have excellent aging potential and will improve in the bottle for many decades. Blazing red and insanely steep, the Ürziger Würzgarten (ERTS-ih-ger VERTS-gar-ten) vineyard fills the picturesque amphitheater formed by this dramatic bend in the river. It produces wines with exotic, spicy aromas that are bursting with tropical fruit flavors. The estate’s oldest vines are found here. 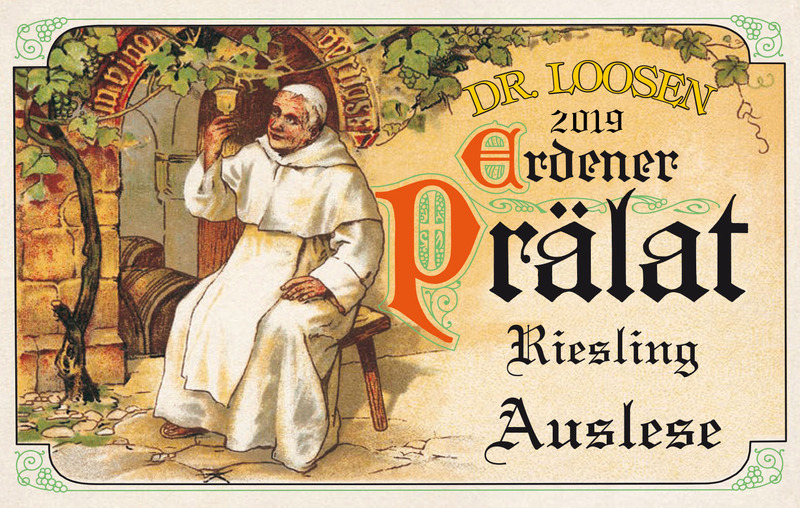 A small slice of perfection, the four-acre Erdener Prälat (AIR-din-er PRAY-laht) produces some of the greatest wines in the Mosel valley. It has 100 percent south-facing red slate soil and an extraordinarily warm microclimate, yielding wines of unequaled power and nobility. The vineyard’s exposure, combined with the warming effect of the river and the massive, heat-retaining cliffs that surround it, ensures exceptional ripeness in every vintage. 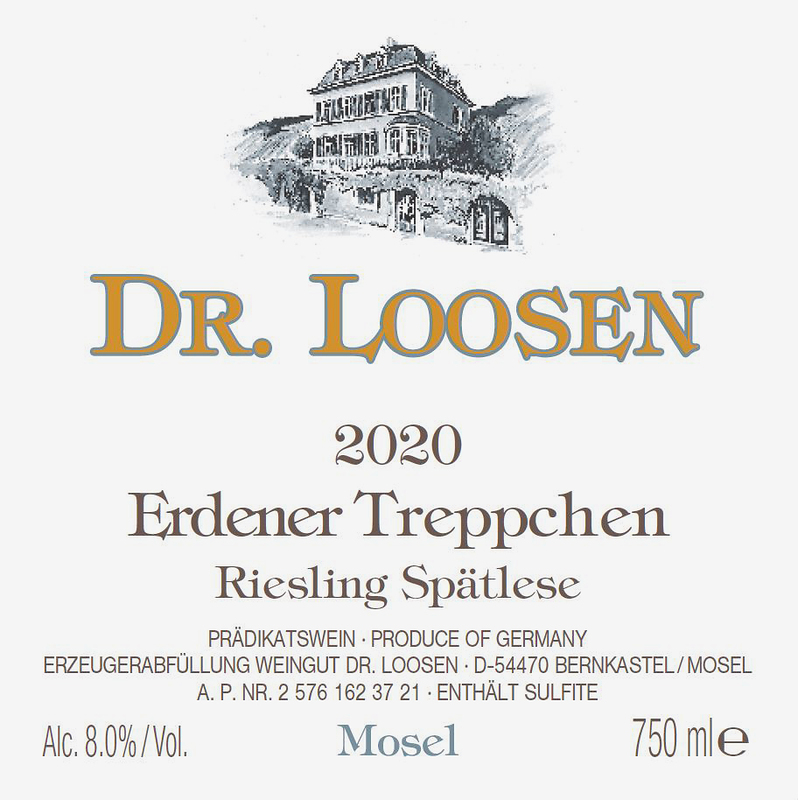 Starting with the 2008 vintage, Ernst Loosen has embarked on a quest to revive the dry Riesling style of his grandfather. All of these wines are fermented with indigenous yeasts in 1,000- or 3,000-liter oak casks and left on the lees for 12 months or more, with no batonnage. 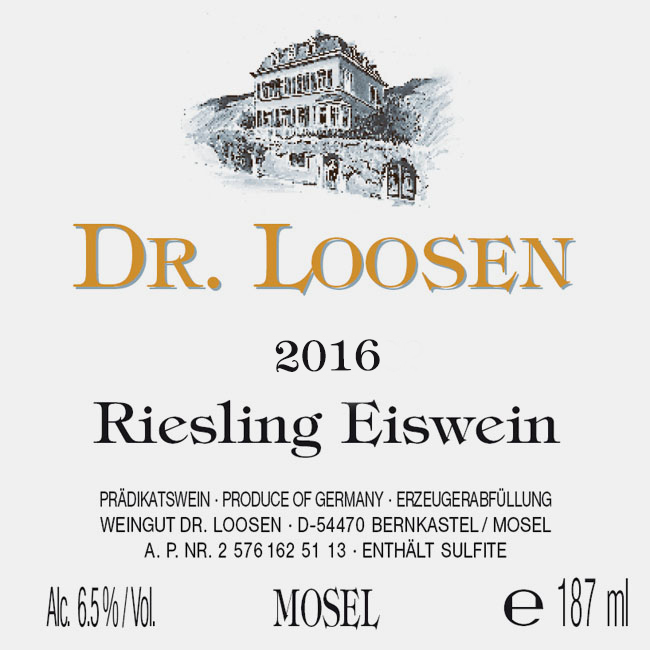 Learn more about Ernst Loosen’s new generation of dry Rieslings here. 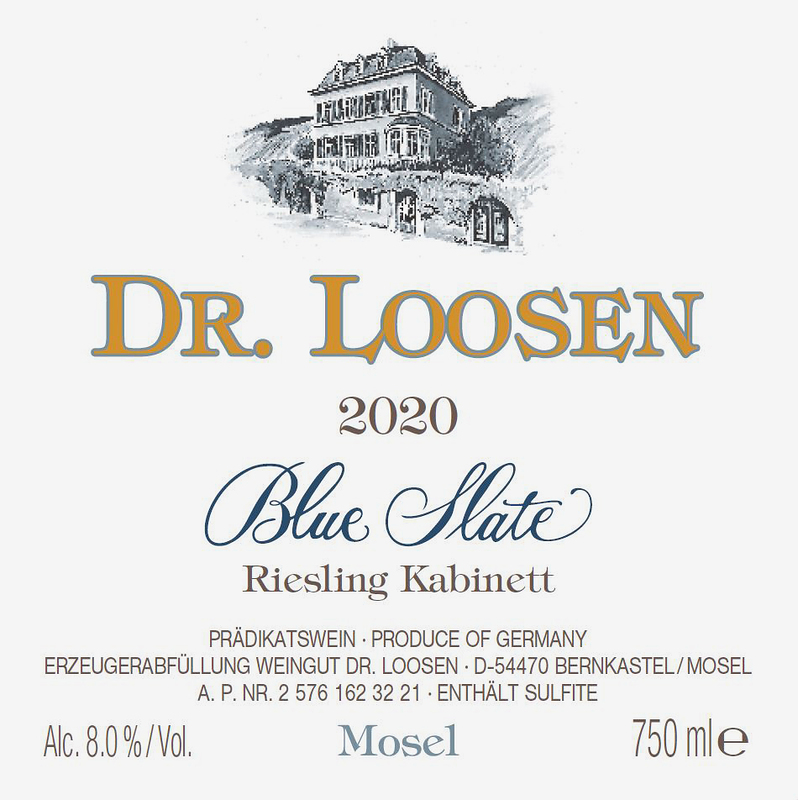 This dry counterpart to the classically fruity “Blue Slate” Riesling Kabinett is produced exclusively with fruit from estate-owned vineyards in Ürzig and Erden that have the iron-rich red slate soil. Fermented naturally in 3,000-liter casks. “Grosses Gewächs” simply means “great growth” in German. It is the term used for a producer’s best dry wine from a classified Grosse Lage (equivalent to “grand cru”) vineyard. 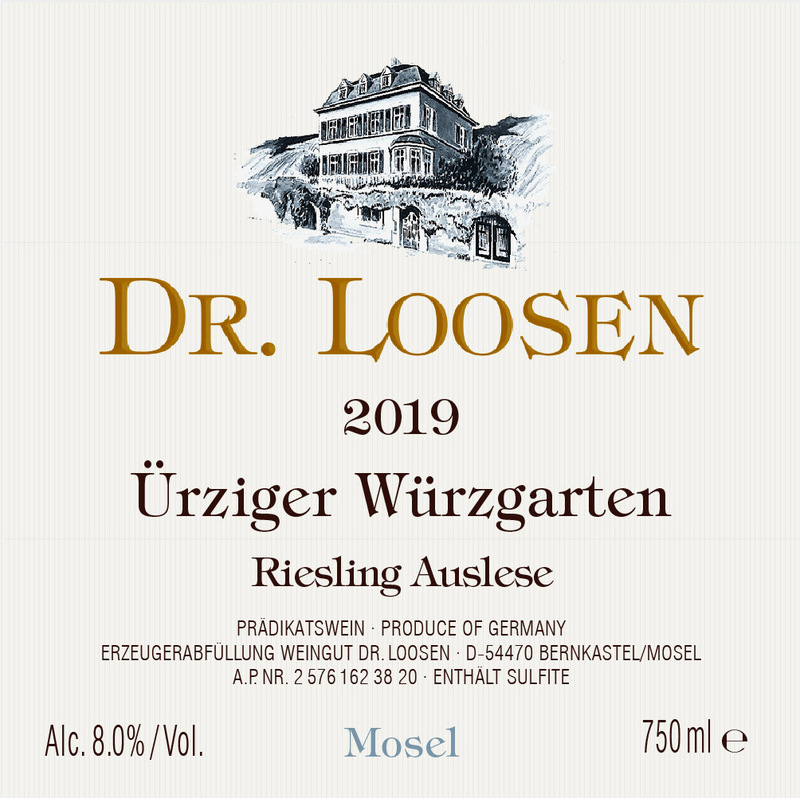 A rich and complex dry Riesling from old vines (“Alte Reben”) in “the Richebourg of the Mosel.” Southfacing and situated between the river and massive, heat-retaining slate cliffs, the Prälat site produces extraordinarily ripe, deeply flavored fruit. 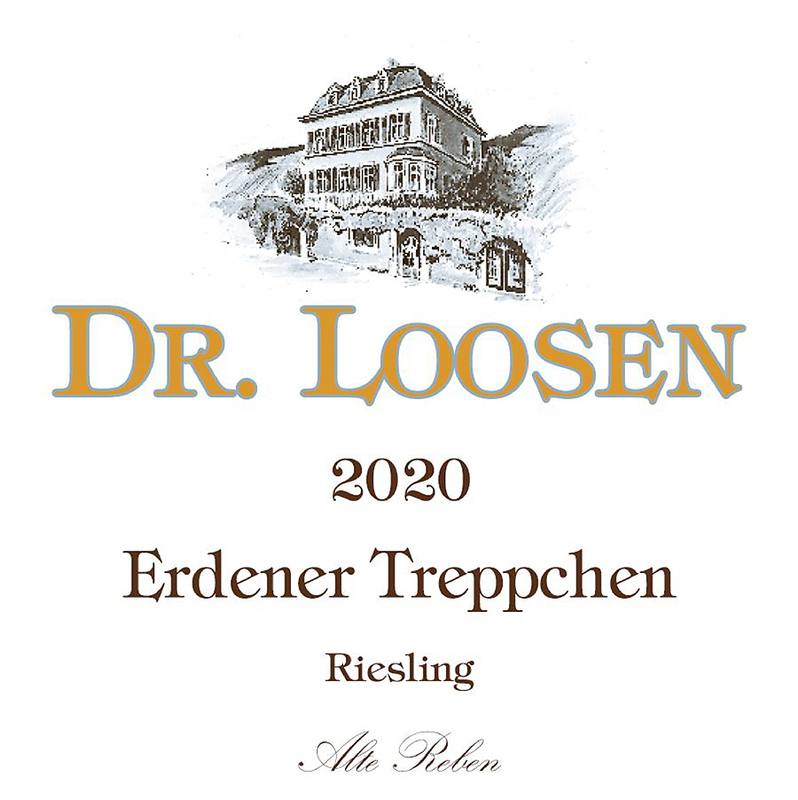 Explosive fruit and an expansive texture from the oldest parcel of the Treppchen vineyard, a windy site that inhibits botrytis, allowing for very long hang time and exceptional flavor development. Only one 1,000-liter Fuder cask is produced. Selected from an extremely old (120+ years) parcel of vines, called Urglück, located in the original part of the Würzgarten vineyard, directly behind the village. It shows the earthy, spicy character of the red volcanic soil here. The Wehlener Sonnenuhr GG exhibits the delicate style and penetrating floral/citrus intensity that is typical of the blue slate soil. The vines here average 60 years of age, so the wine is not labeled as Alte Reben. That designation is reserved for wines from 100+ year-old vines. The Graacher Himmelreich GG shows the typically bright aromatics and assertive mineral character of this very steep, rocky vineyard. The Bernkasteler Lay vineyard typically produces dry wines with a complex aroma that combines floral, fruit and herbal components. Classic blue slate fruits, such as apple and white peach, emerge on the palate, with a fine, elegant texture and a pure finish. Picked and pressed while the grapes are frozen, this vibrant, racy dessert wine conjures flavors of densely packed pear, apple and guava, with an intense, nervy edge in the aroma. It is luscious, silky and juicy on the palate, with bright acidity giving it a crisp, dynamic finish. Available in 375ml and 187ml bottles (the 187ml bottle is packaged in a special display tube). 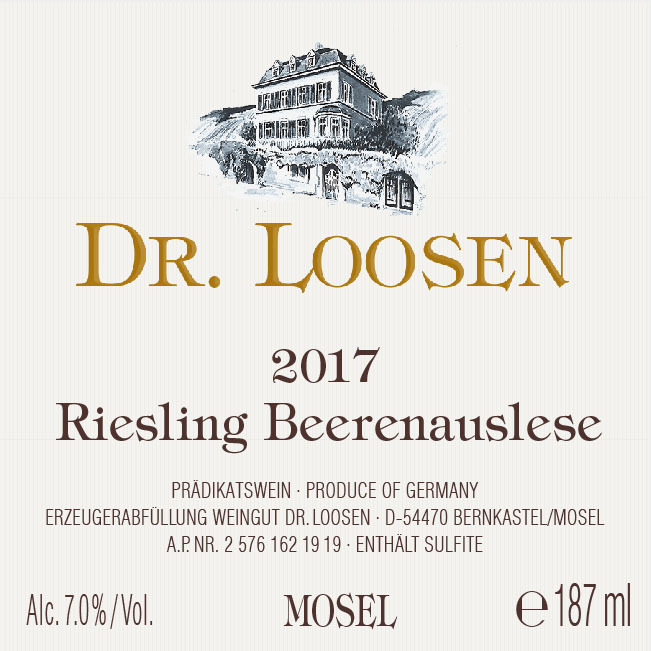 Beerenauslese (pronounced BEAR-en OWS-lay-zuh) means “berry selection” in German. It is an intense, ultra-concentrated dessert wine made from hand-selected grapes that have been shriveled about halfway to raisins by botrytis (the “Noble Rot”). BA has the same minimum must weight as Eiswein, so they have about the same sweetness. But BA has the distinct honeyed character that comes from botrytis, giving the wines a more complex aroma and a lusher texture. 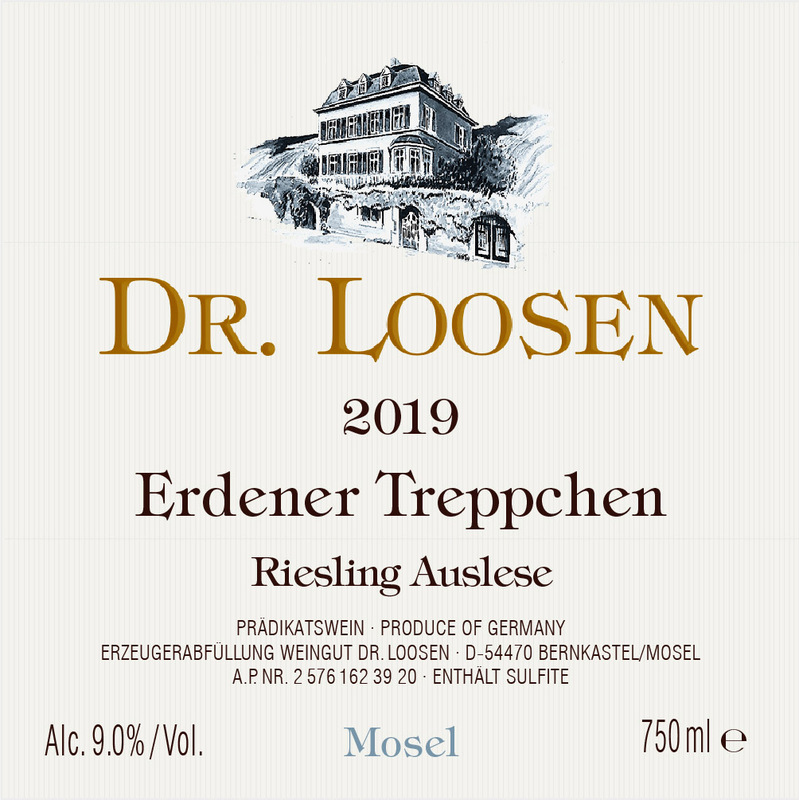 Trockenbeerenauslese (TRAW-ken Bear-en OWS-lay-zuh) is German for “dried berry selection.” This is the most labor-intensive and intensely concentrated wine that we can produce. It is made by individually selecting only the fully shriveled, botrytis-affected grapes and pressing them very slowly to yield a tiny bit of ultra-dense nectar. The wine has a multi-layered, deeply complex aroma of fruits and is so intensely sweet on the palate that it makes you shudder. 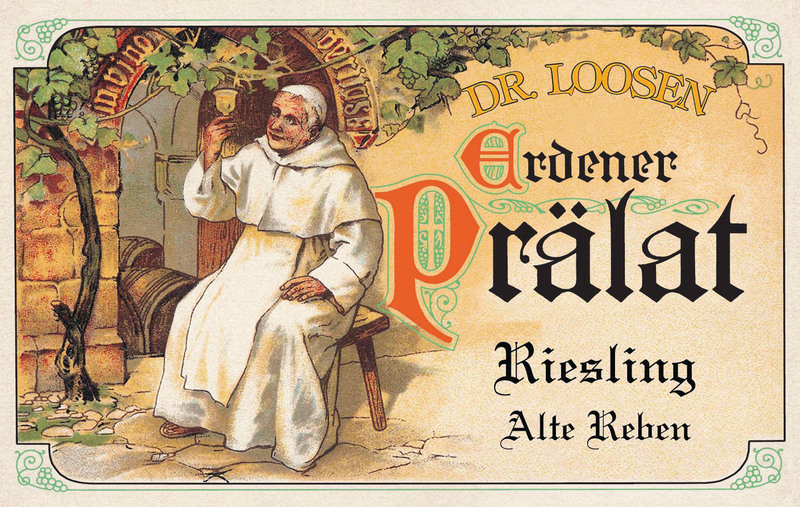 But once again, Riesling’s naturally brilliant acidity keeps the wine lively and freshening.